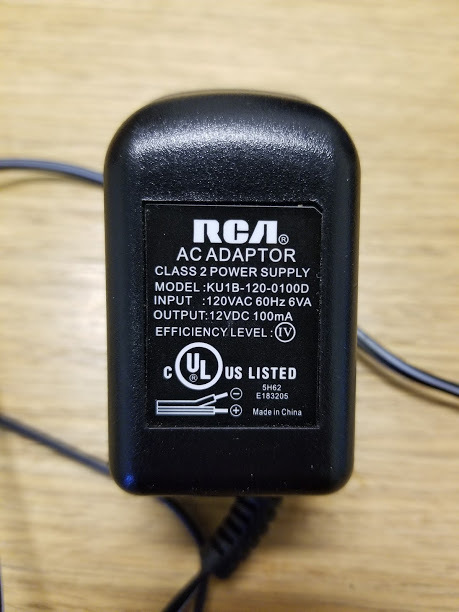 ultravista wrote: I have many power supplies that are labeled as 12-15V and 100-150ma but when measured, are nowhere near the printed output. All are over voltage and current. The current rating is not so important when it is above the 150 mA which are required. You can use a PS with 70 A rating although this is of course completely overdone. a) Noise free transformer power supplies are rare to find. In some countries they are kind of forbidden because of energy wasting. You only can buy switched PS which cause RF noise. b) If you are still lucky to find one on ebay or similar it is often not clear whether the 12 V are stabilised or not. In many cases they have no stabilisation and the voltage drops maybe from 16 V to 10 V when a load is connected. Additionally they have a big 100/120 Hz hum on the output. I cannot give an advice where to find a suitable readymade PS because this depends on where you live and which sources are available in your area. But generally small stabilised wallplugs with a transformer are rare. Sometimes you can still find some on ebay. But make sure they are stabilised. And be careful: Some sellers do not understand the difference between a switched PS and a transformer PS and label their offers wrong! I am afraid this is all a difficult matter nowadays. Just picking up on what Heinrich, said - my german made psu is about the size of a small brick and freestanding, suppied by a cable - it's no "wall-wart." Heinrich - thank you. I am in the US. I have three power supplies. All three are approximately the same. To keep noise down, do you recommend wrapping through a toroid (if yes, which and how many turns)? From my slender electrical knowledge and past experience, I really woudn't use either of the first two pictured as they may prove a fire hazard or at least are likely/possible to overheat. I believe that You need at least 100ma to be safe, but of course higher than 100ma would be fine, the mini whip wil lonly draw what it requires. 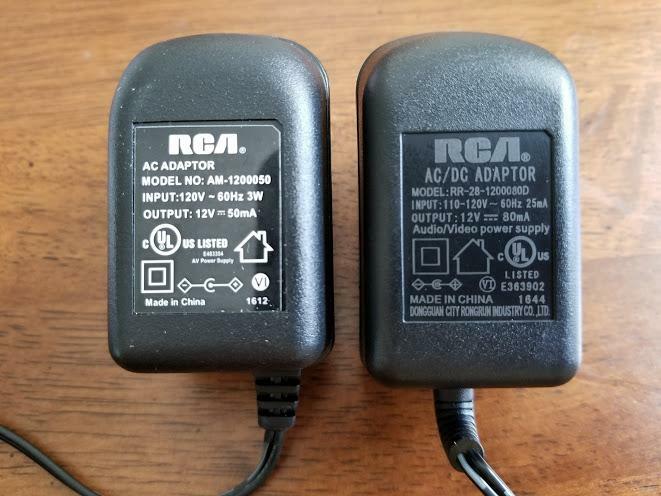 In theory at least, that one shown in your third picture - 12V/100ma should be OK.
Just one other thing that occured to me - I have two dell laptops, one of which has a replacement power supply/battery charger (made in China). The second laptop (same power requirements) has the original version (very possibly also made in China - haven't checked yet). However, using the "replacement" unit anywhere in this fairly large house creates such a noise storm as to totally wipe out radio reception on the RSP. Got any dodgy supplies around? All three wallplugs seem to be overchallanged for me. They have no or little headroom. Maybe the 100 mA type could work. But all three seem to be switched types and especially in the vicinity of an E field antenna (like the whip) RF noise must be taken into account. From the label alone you cannot say how much ripple they have. I had wallplug PSUs here which produced extreme 100 Hz hum on the active antenna because the residual ripple was very high. Winding the cables through a toroid or on a ferrite often does not help much against RFI. One should apply special line filters both at the input and output (commom mode and non common mode filters combined) and sometimes extra shielding of the PSU is required. Too much extra work for such a wallplug! As Paul said: Sometimes it pays to buy a dedicated linear PS when no other solutions are available. I also use Statron power supplies. I had the option of self-tinkering, but it is almost impossible to get a suitable transformer here. You can get transformers in some surplus shops, but they all have the "wrong" voltage which would result in too much heat dissipation at the linear regulator. The Statron PS have all you need. The price is adequate and you receive a really heavy, solid brick which is noise-free. Unfortunately they only start at 6 A for 12 V. But with the "rest" you can easily power your receiver or even small transceiver. This is not meant as an advertisement! But they are the only ones here where you still can buy solid good old linear PS. If so would you care to message "ultravista with an opinion. This PS was a short time ago sold here in Germany under the label "Voltcraft". This Chinese PS has various names around the world. The term "linear adjustable" is misleading. It is a switched PS! In this German blog someone has dismantled the unit. It is not necessary to understand German. A look at one of the pictures shows the big choke typical for switched PS. And the heatsinks are too small for linear regulators at that amperage. I cannot say how good the RFI filtering is. Normally the low price indicates that the company has saved components in the filter section. For our purposes in a sensible RF environment I would be careful to blindly buy such a PS. Hi all. I have the same antenna. I mounted on the roof of our building. I had very clear reception until may, when the ventillation system of the building is modernized, and added inverters to the fan engines. The result is S6-S9 noise around from 8 to 17 MHz. I went to the roof with a pocket radio, and the noise is there everywhere. So i must live with it... But the other bands are OK. Especially on Long and Mediumwave! It's a big "soivet-style" budilding with 120 homes. Last edited by ha4006swl on Thu Jan 01, 1970 12:00 am, edited 0 times in total.